Currently, there are no accredited schools in Montana that offer training programs specific to sonography tech, although training in radiography is available at a few institutions, with some coursework in sonography. In order for an individual to complete training in sonography at an accredited school, he or she will have to either attend school out-of-state or take online courses. A listing of accredited schools can be found through the Commission on Accreditation of Allied Health Education Programs. Most accredited programs in Diagnostic Medical Sonography are between 1-4 years, depending on the institution, offering a certificate, an Associates of Applied Science degree, or a Bachelor of Science Degree, with a concentration in General Sonography, Adult Echocardiography, Pediatric Echocardiography, and Vascular Sonography. After completing the program, an individual can sit for American Registry of Diagnostic Medical Sonographers (ARDMS) exam to be a licensed technician. Most institutions require prerequisites in college-level algebra, physics, communications, and human anatomy and physiology in order to be accepted into the program. During the completion of the curriculum, a student will receive training in basic patient care, medical ethics and laws, medical terminology, and pathophysiology. A student will then continue on to learn about the technology, including acoustic physics, Doppler ultrasound principles, and ultrasound instrumentation. The student will also learn how to recognize, identify, and document the images, and, with the supervision of a qualified physician, diagnose irregularities and disease. In addition to coursework, students will be required to participate in hands-on training with clinical rotations. According to Indeed.com, the average annual salary across Montana for Diagnostic Medical Sonography is $64,000, with a range of $54,000 in Bozeman to $70,000 in Billings. The national average annual salary is $70,000. 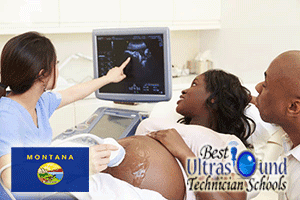 There are currently no accredited schools in Montana for Diagnostic Medical Sonography. Nearby states have programs available at the following institutions: -Boise State University in Boise, Idaho -Southeast Technical Institute in Sioux Falls, South Dakota -Laramie County Community College in Cheyenne, Wyoming. Online coursework training is also an available option. There are also three accredited online programs available through: -Washburn University in Topeka, KS -Jackson College in Jackson, Michigan -University of Wisconsin-Milwaukee, in Milwaukee, Wisconsin.